Today, Deep Silver announced changes to the release dates of their upcoming title, Risen 2: Dark Waters! The pirate RPG will be available in store on 3rd August in Europe. Console versions of the game will be released on the Xbox 360 and the PlayStation 3. The console versions of Risen 2: Dark Waters will offer extra content on both platforms, including the episode “The Air Temple” which features several hours of additional gameplay. In this sub-plot, the hero embarks on a quest to discover the lost temple, source of air magic. When he hears rumors that his old acquaintance Eldric has been seen in Antigua, the hero knows that he needs to pick up his trail in order to find Storm Island, where the Air Temple is located. 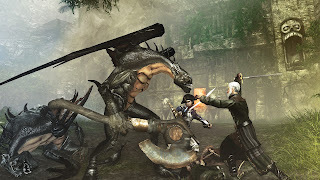 Risen 2: Dark Waters for PC is unaffected and is set for release on 27th April 2012. The game will be released via digital distribution for PC and as a retail version for both PC and consoles. Additionally, an exclusive Risen 2 Collector’s Edition will be available in certain territories. See a screenshots below from "The Air Temple"!